Today, digital security is top-of-mind. From the boardroom to the backroom, everyone is asking the same questions, “How do we protect our digital experiences? How do we ensure our website is safe for our visitors? How do we make sure that no one can steal our content?” But safeguarding a digital experience isn’t a one-size-fits-all solution. It often involves multiple techniques and layers of security. 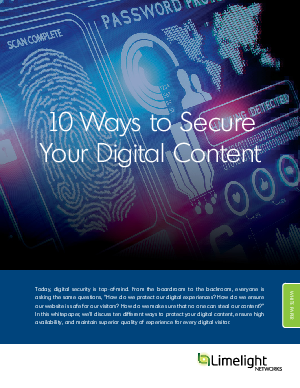 From verifying your identity (with HTTPS) to encrypting sensitive data to restricting access and protecting multimedia content, you must approach security in a layered manner, employing multiple means and techniques to protect the digital content through which your audience interacts. This paper explores ten different methods and technologies that an organization can employ to protect its content. This multi-layered approach can effectively protect your digital content, ensure high availability, and maintain superior quality of experience for every digital visitor.